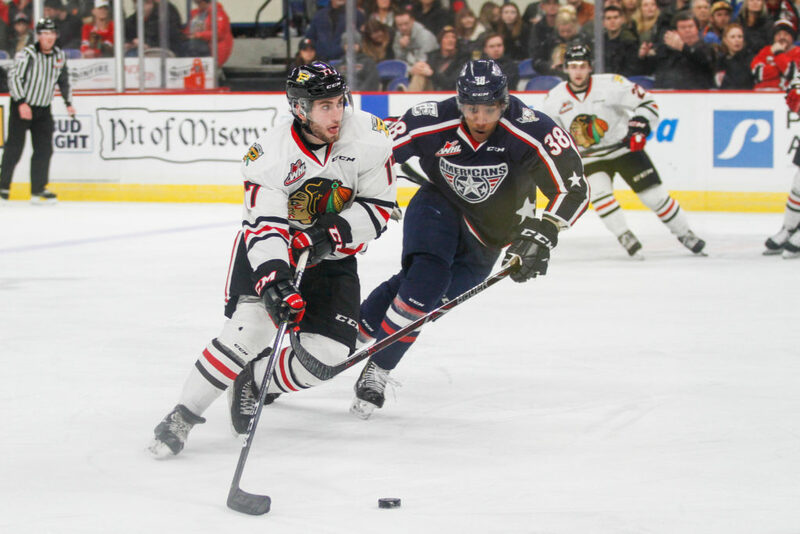 A playoff game seemed to take shape as the Portland Winterhawks faced the top U.S. Division team in the Everett Silvertips as the Hawks returned to home ice for the first time in three weeks as they had headed to the Eastern Swing. The swing for them was highly successful, capturing all wins except one in Prince Albert, with 10 points to their credit with now less that a dozen points separating Everett and Portland with almost 30 games left in the season. The Hawks debuted “Tommy” a new mascot of sorts with black feathers a black streak in his head, more angry eyes and in slacks instead of rink pants. The Hawks on the ice also put Joel Hofer in net following his game in Saskatchewan and to complement, the seventh man happened to also be a goaltender who wore number 30 same as Hofer. Everett countered with Dustin Wolf, who had stymied Portland on more than a few occasions. Nineteen shots went Portland’s way, 18 by Everett through two periods and no one could score. Just over three minutes into the third, Joachim Blichfeld wired on past Wolf to give the Hawks the lead. Jared Freadrich scored just over a minute later while on the powerplay and the Hawks didn’t look back. Cody Glass added another marker just over eight minutes later. While shorthanded, Jake Gricius found the empty net to make it 4-0 and Brendan DeJong added Portland’s fifth goal 30 seconds later. The eyes were on on Hofer, trying to get the shutout, but with just 15 ticks on the clock, Everett found a way to get to the back of the net, still giving Hofer the win, but dashing his hope of a shutout at 5-1. Portland had a two-shot advantage, 34-32, over Everett and got both a powerplay goal and short-handed goal on five chances, while keeping the Silvertips off the scoresheet. The next night Portland faces a Tri-City team that has seemingly had their number at every turn. All the games have see Tri-City win, but Portland has managed to get the “Loser point” by forcing overtime and/or a shootout. Shane Farkas graced the pipes for the Hawks and Talyn Boyko handled the duties for the Americans. Portland was unable to score on their five chances at the powerplay, while giving Tri-City a goal on three attempts. Midway through the first and late in the first, Tri-City put up goals as they led 2-0 at the end of one period. Early in the second, Cross Hanas halved the Tri-City lead and it remained a 2-1 Tri-City lead after two. Tri-City upped the lead to two goals again and looked to be cruising well. Joachim Blichfeld scored a rocket shot just over 14 minutes into the third to put the game within reach at 3-2. However, seconds later, a miscue in the Tri-City zone led the Americans on a breakaway shot for which the only hope was to trip up the opposing player. With a Penalty Shot called, Farkas had to come up big. Shane Farkas was able to stop Nolan Yaremko on a penalty shot a few seconds after the Blichfeld goal, but Portland could not net the equalizer ad Boyko faced a lopsided 47 shots to just 18 from Portland. Portland still holds two game in hand on the Tips, now with nine points separating them and Spokane has moved into third with four games in hand on Everett, two on Portland, but are unable to catch the Hawks with straight wins. Tri-City has played the same number of games as Spokane and are three back, with Seattle much further behind. Seattle, Kamloops and Prince George all remain within a point to grab the last remaining wild card spot which looks like it will go down to the wire. Portland will play its next five at home, then play a US mini trip of three games followed by three more at home, before ending off with three more road games to close out February.